We will soon know whether that first iffy trailer was an outlier or a sign of things to come. Hey, remember Powers? Announced last year as the first original series for the Playstation Network, it was planned for a December, 2014 debut. That obviously didn't happen, but via a post this morning on the official Playstation blog, co-creator and TV series executive producer Brian Michael Bendis revealed that all ten episodes are complete, and that the show will finally premier on March 10, 2015. Sony will be making three episodes available at launch, with a new episode following each week. The pilot will be available to all Playstation Network members for free, with subsequent episodes available for purchase (Playstation Plus members will get the entire series free with their subscription). Based on the long-running Image/Marvel Icon comic created by Brian Michael Bendis and Michael Avon Oeming, Powers follows a Chicago homicide division tasked with investigating crimes committed by, or to, superpowered individuals. Focused on Detective Christian Walker, himself a former superhero, and his rookie partner Deena Pilgrim, the series has explored celebrity culture, the political and social impact superpowers would have on the larger culture, and even the origins of humanity over its now 15-year run. Powers stars Sharlto Copley as Walker and Susan Heyward as Pilgrim, along with Michelle Forbes, Eddie Izzard, Noah Taylor, Logan Browning, and Olyesa Rulin. Novelist Charlie Huston and TV writer Remi Aubuchon share showrunner duties. Brian Michael Bendis here again, co-creator of the POWERS comic books and executive producer of the show, and I have some big updates from the set of POWERS, the first original live-action series for PlayStation Network. 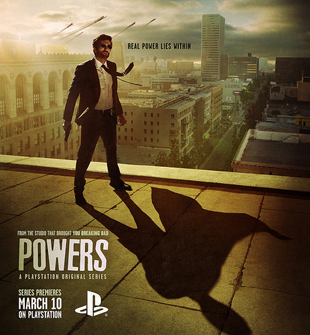 I'm happy to report that production has wrapped on all 10 episodes of POWERS. Under the skillful hands of our showrunners Charlie Huston and Remi Aubuchon, our amazing directors, writers, cast and crew, the episodes are coming together beautifully. As I sift through different cuts of the episodes and the raw footage, I've been hearing from our cast on the set about how much fun everyone has been having. They battled the Atlanta weather and the flu and they pulled together and really gave it their all. So it is my honor and privilege to officially tell you that PlayStation will be releasing the first three episodes on March 10th followed by the debut of a new episode every Tuesday. The first episode will be free for everyone at PlayStation.com/Powers and the full season will be available free to members of PlayStation Plus...which you should have already because it's awesome. As we head toward the launch date I will be updating you on all kinds of special surprises and giveaways. For instance, for those of you looking to get a head start into the POWERS universe, this Wednesday, January 21st at your local comic book store or at comixology.com you can pick up a brand-new POWERS number one...its double-sized story for the regular price. This is a perfect place for new readers and old to hop on board the world of POWERS. And you can catch me tonight on Late Night with Seth Meyers talking more about the show. Yes, it is very weird to even type those words. Be sure to also follow the official pages on Twitter and Facebook for more fun extras. Thank you to everyone who has been sending me notes on Tumblr and Twitter about their eager anticipation for the show. I can't tell you how much we all appreciate that. We think of you during the long hours...we really do. So, it's not going to be too much longer... March 10th!! I leave you with the key art from the series. It's just a little tease, a little taste, of what's to come over the next couple of months. See you online...and if I killed you in GTA V, I'm sorry (not really).